A good trainer will tell you training young horses requires patience. Otherwise, a perfectly good horse can be ruined. An experienced trainer knows when to quit; a skill far more important than any other. If you push a horse too far or too fast, you simply set the stage for behavior problems and wrecks in the future. Patience is not just a lofty virtue in a trainer, it’s a prerequisite. Horse trainers, like horses, learn from experience. Generally experience can be good or it can be bad. Pushing a horse to learn faster than he really comprehends means the horse doesn’t have a sound foundation. Ever have a math teacher that kept going full tilt while you weren’t keeping up. It wasn’t any fun and you probably had a hard time trying to figure out what to do. Training horses is no different than you in an advanced math class. With the teacher racing through the material, you end up lost, confused, and angry. The same with horses. You have to slow down! What is so simple to you is confusing to him. Experienced trainers know when the horse had a good day and stop just like good math teachers know when a student needs to quit for the day. In training our horses, we believe in constant reinforcement of learned skills to build confidence while teaching new concepts slowly. For instance, let’s say we have a horse riding well, but not neck reining. We don’t teach neck reining in an all day session. It is developed one little piece at a time and in a way that can seem excruciatingly slow to some people. The end result speaks for itself. A horse that turns with wrist movement instead of plow reining or leg cues. We aren’t knocking leg cues and use them also. But a proper neck rein means the horse handles with a light touch of the reins, nothing more. Patience in the trainer comes with practice and learning to accept hundreds of small successes over long periods while the horse is allowed to continually succeed by performing what he already knows over and over. In this way, you wind up with a confident horse willing to learn instead of a horse soured on learning because an impatient teacher has created or caused unnecessary confusion and frustration. 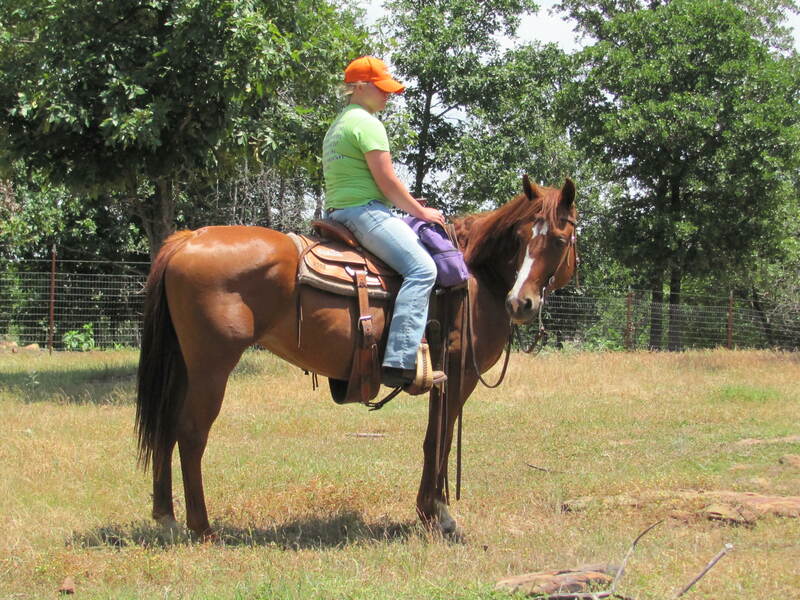 Speck is an excellent trail horse and always remains under control. 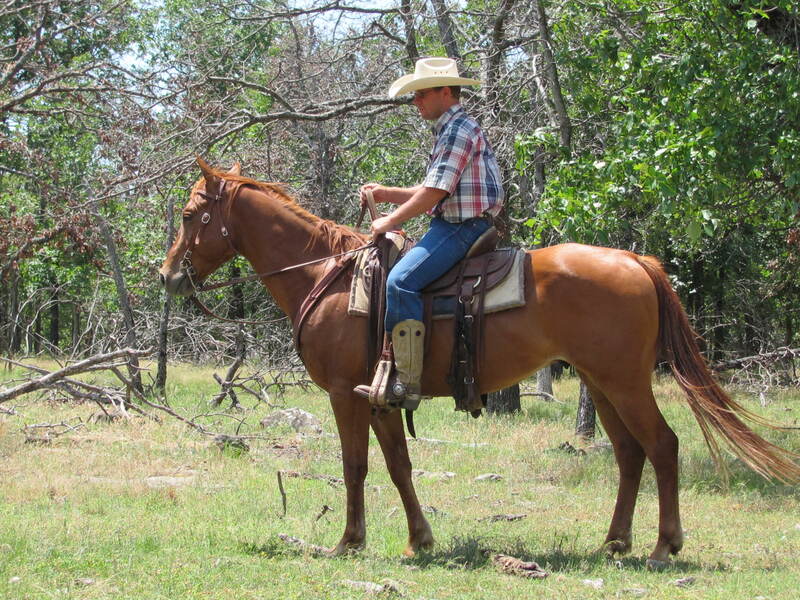 He is an AQHA registered gelding and halfway through our two-year training program for trail horses. He likes people and enjoys being around everyone. Speck is hard to beat in terms of reliability. A few weeks ago, we were riding when a much larger mare got startled. The mare who was behind Speck took off and ran right into the back of him and then started around him. Speck just looked at the mare as if to say, ” what’s your problem? ” Steady and calm Speck is a favorite. Click here to check out what Speck has been up to! Jack is a real American hero. He found a lost three-year old boy. News on 6 reported the story. The video gives the details with a happy ending. The boy, age 3, wandered away and got lost. Jack was being worked along the highway when fast-moving cars, helicoptors, and planes began filling up the area. A police car pulled over and asked Shawn if he had seen the boy. Typical of Shawn, he offered to help search the area using Jack. The horse is used to the rough terrain and made the perfect horse for the job. Jack is alert and attentive to his surrounding without being afraid. With all the noise from the planes and helicopters, it was really hard to hear. But Jack’s keen ears picked up the boy’s German Shepherd barking and growling. Careful to pay attention to his horse, Shawn urged Jack to go toward whatever had caught his attention and found the boy in a ravine. Law enforcement were immediately notified and emergency crews took over. After more than four hours in the hot sun and working hard, Shawn headed Jack back towards the ranch for well deserved, long drink of cool water. We’re proud of Jack and thrilled Shawn was able to help out. Training horses is great fun, but getting to help others at the same time is icing on the cake. We’ll show you a photo of Jack and tell you more about him in future posts. We set out to develop a two full year training program for trail horses. 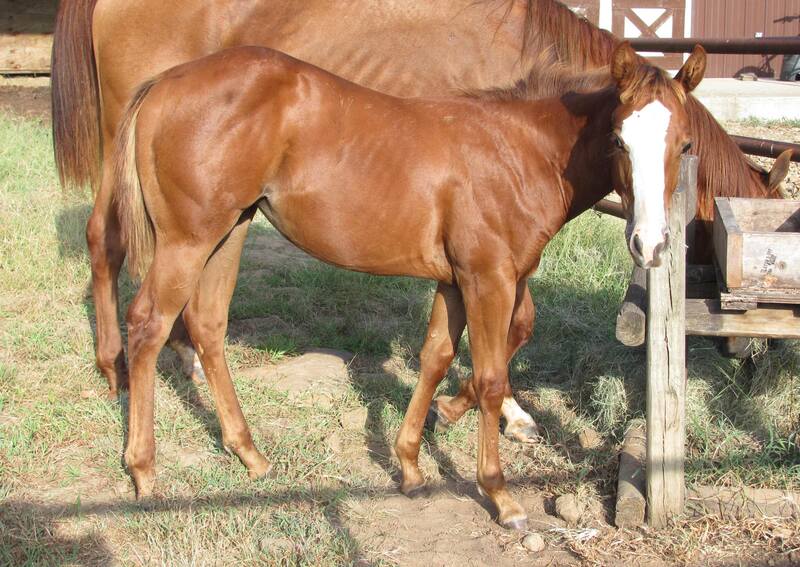 The program is designed to expose two year old geldings to everything we can dream up. The horses are ridden nearly every day and taught to be patient, calm, and ready for anything. We start with young horses for several reasons. First, to avoid having to unfix problems someone else created for us. Second, so the next owner has a well broke horse with lots of life remaining and plenty of energy for all kinds of activities. The program started like so many things in life do, pure frustration! It seemed the world was full of people with good trail horses for sale. You know the ones; can’t catch, can’t bridle, won’t stand while you mount, don’t neck rein, won’t back, and booger at every leaf blowing down the trail! It really got old driving 40 miles to the next great prospect and finding another dud after wasting a lot of gas. The goal is to turn out eight horses a year. The horses are worked initially with one trainer and slowly taught basic skills. Later, the horses are presented with numerous different riders to get used to the idea that more than just the trainer is going to be riding. Detailed training logs are kept to monitor the progress of each horse and to allow potential buyers the opportunity to see the training. As time passes, we hope to show you some of these horses in this blog and let you get to know them. The American Competitive Trail Horse Association, ” ACTHA ” was founded by Karen VanGetson and Carrie Scrima. They ” were tired of long drives to multi-day, timed competitions. . . and wanted a venue where they could enjoy their horses and the wonderful scenery around them. ” Of course they also needed a challenge and a chance to learn as well as show off their horse’s talents. They set about to develop an organization to meet their needs plus a lot of camaraderie and fun! ” Today ACTHA is a national phenomenon with rides all across the USA. ” If you need some good fun and a little competition, you ought to check them out! Don’t Forget; You Get What You Pay For! I was talking with a lady last week about the price of horses. She doesn’t own a horse, but heard people were practically giving them away. Apparently a friend of hers took a horse to the sale and it brought almost nothing. It is a pretty common occurrence in this economy. You can buy those four-legged animals that any four-year old child can tell you is a horse. But . . . . . . we see it a little differently than some folks. The typical first time horse owner is concerned about the price paid for the horse and the color of the halter. Once you have owned a number of horses, the price is viewed in a broader perspective. You still are concerned about how much you spend, but you remember the true price you pay. For instance, how much did that horse cost me when I add back in the emergency room visit, ambulance ride, and the missed week of work. How much did the horse cost me if the cost after I factor the repair to the truck door where he kicked in the side? You get the point. To our way of thinking, you either buy a horse to ride or you want it for a pasture ornament. Nothing wrong with decorating the pasture, but it’s probably not the reason you gave your spouse when you wrote the check. If you have never owned a horse and thinking about the first one, do your homework BEFORE you buy. Find a reputable place to buy it. Make sure you can ride it. Go back several times, don’t buy on an impulse. Ignore the urge to find a pretty one. It is far less expensive and a lot safer to get right the first time! ” Training outside the box is something AQHA Professional Horsewoman Lynn Palm does with all her horses in training, especially competition horses. Trail riding is an opportunity to strengthen the bond with your horse by overcoming new obstacles together and encountering situations not found in an arena setting.” She gives a list of 40 Trail Riding Tips at the American Quarter Horse Association webpage that all new riders should read. Palm says to always be prepared to expect the unexpected. We wholeheartedly agree! Part of the fun as well as the benefit to trail riding is overcoming situations that suddenly come up. These experiences make for better riders and more importantly better horses! You are currently browsing the horsesfortrail blog archives for May, 2012.